The name of this organization shall be the SHADOW HILLS WOMEN’S CLUB. The object of this organization shall be to conduct the golf and related social activities for the Women Members of Shadow Hills Country Club. Sec. 1 The members of the Shadow Hills Women’s Club shall consist of all women who are members in good standing of Shadow Hills Country Club. Daughters of members between the ages of 18 and 23 may apply to the Board of Directors for membership. Sec. 2 This organization shall maintain memberships in and abide by the rules and regulations of the Oregon Women’s Golf Association (OWGA), the Oregon Golf Association (OGA) and other organizations as may be determined by the Board of Directors. Sec. 3 Dues and fees may be charged for such activities as may be determined by the Board of Directors. Sec. 1 There shall be two (2) regular meetings of the General Membership held in the spring and fall of each year; hereafter called the Spring Meeting and the Fall Meeting. Additional meetings may be held at the discretion of the Board of Directors. Sec. 2 Notice of such meetings shall be communicated to the membership at least ten (10) days prior to the meeting date. Sec. 3 Twenty percent (20%) of the dues paying members of the Women’s Club shall constitute a quorum for the transaction of business. Sec. 1 Personnel: The Elected Officers shall consist of the newly elected President, President-elect, Secretary, Treasurer and Treasurer-elect. Sec. 2 Nomination: Prior to the Fall Meeting, the Nominating Committee Chair shall present a slate of one (1) or more candidates for each office. The slate shall be communicated to the membership at least ten (10) days prior to the Fall Meeting. The President will recognize additional nominations from the floor at the Fall Meeting. Sec. 3 Officers shall be elected at the Fall Meeting to serve a term of one (1) year from January 1 through December 31. The President-elect shall become President the year following her election as President-elect. The President shall become Past President the year following her election as President. The Treasurer-elect shall become Treasurer the year following her election as Treasurer-elect. Sec. 4 Vacancies: Vacancies occurring among elected Officers shall be filled by a majority vote of the remaining members of the Board of Directors. Persons so elected shall serve until the expiration of the original term of office. Shall preside at all meetings and functions of this organization. Shall call special meetings of the Executive Committee and/or Board of Directors. Shall call special meetings of the General Membership with the approval of the Board of Directors. Except as otherwise provided, shall appoint chairs for all Committees. Is an ex-officio member of all Committees except the Nominating Committee. Shall name the auditing committee comprised of the President, Past President and President-elect. Said committee shall audit the financial records of the Shadow Hills Women’s Club within thirty (30) days after year-end. Shall update the President’s notebook and pass it on to the incoming officer at year end. Shall assist the President and preside at all meetings in her absence. Directors Meetings and report publicity activities. 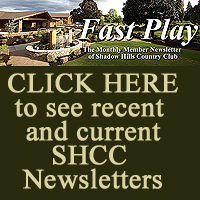 Shall act as Publicity Chair for communication of all golf and social activities of the Women’s Club in the monthly Shadow Hills Country Club newsletter, web-site and e-mail. Shall be responsible for duties associated with nominating and presenting the Kathryn Schneider Service Award at the Awards Ceremony during the Fall Meeting, when recommended by the Executive Board and approved by the Women’s Board. Shall update the President-elect’s notebook and pass it on to the incoming officer at year end. Shall attend and keep minutes of the meetings of the Executive Committee, the Board of Directors and General Membership, and submit approved minutes to be posted electronically. Shall keep roll call at the Executive Committee and Board of Directors meetings. 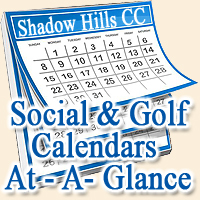 Shall contact new Shadow Hills women members to welcome them and introduce them to golf and social activities. Shall send cards on behalf of the Women’s Club (i.e. get well, sympathy, congratulation). Shall update the Secretary’s notebook and pass it on to the incoming officer at year end. Shall serve for one (1) year from the time of election. Shall attend Board of Directors meetings and present the current income/expense report. Shall maintain and distribute an accurate record of the Club Membership. Shall keep full and accurate accounts of all Club monies and pay all approved bills by check, checks to be signed by the Treasurer, the Treasurer-elect and/or the President. One signature is required on all checks. Shall be present for the annual audit, along with the Treasurer-elect. The audit committee is the President, Past President and President-elect. Said committee to audit the financial records of the Shadow Hills Women’s Club within thirty (30) days after year-end. Shall present the budget, as approved by the Board of Directors, into the minutes of the Spring Meeting. The budget shall be presented in written format and the Treasurer shall be prepared to review the budget, if requested by the general membership. Shall present a review of the financial affairs to the general membership at the Fall Meeting. Shall update the Treasurer’s notebook and pass it on to the incoming officer at the end of her term. 2 Shall assist the Treasurer and assume her duties in her absence. Shall be responsible for managing the Women’s League Enrollment Records for all women’s leagues. Shall attend the Shadow Hills Women’s Club Board of Directors Meetings. Shall be present, along with the Treasurer, for the annual audit. The Board of Directors shall consist of the five (5) elected officers, the immediate Past President and the Chair(s) of the following committees: 18 Hole, 9 Hole, Twilight, Social, By-Laws, Shadow Hills Women’s Invitational (SHWI), Oregon Women’s Golf Association (OWGA) and Valley League Team Play (VLTP). The Board of Directors shall meet regularly each month. Any change in the regular meeting schedule will be at the discretion of the President. Special meetings may be called by the President or upon the written request of one-half (1/2) of the members of the Board of Directors. The Board of Directors has general charge of the affairs, funds and property of the Women’s Club. Any proposed major changes in Club policies or activities must be presented to the General Membership for ratification. The Board of Directors shall review the expenditures of all Club monies. Other duties of the Board of Directors are explained within the Standing Rules section as an attachment to the By-Laws. Modifications to the duties of the various and many Chairs do not require a vote of the general membership. The section(s) of the Rules and Regulations of the By-Laws is to be used for description and terminology only and is overseen by the Board of Directors. The Board of Directors passes by a two-thirds (2/3) majority vote any new By-Law or modification of By-Law that may be submitted for consideration of the General Membership; excepting the job description duties of the Chair/s as stated in the Standing Rules section. The authorized signers on the Women’s Club’s bank accounts shall be the President, Treasurer and Treasurer-elect. A majority of the members of the Board of Directors constitute a quorum. For purposes of determining a quorum, in the event of an absence of a voting member, the co-Chair or other identified representative may vote at the Board Meeting. There shall be an Executive Committee, which may represent, and when necessary, act for the Board of Directors between meetings. The Executive Committee shall be comprised of the five (5) Elected Officers: President, President-elect, Secretary, Treasurer and Treasurer-elect. Quorum: A majority of membership of the Executive Committee shall constitute a quorum. Sec. 1 There shall be the following Standing Committees: 18 Hole, 9 Hole, Twilight, By-Laws, Social and the immediate Past President as the representatives to the Shadow Hills Country Club Board of Directors. The Standing Committees shall attend all regularly scheduled Shadow Hills Women’s Club meetings. Sec. 2 Committee Chair/s shall choose their own co-Chair and committee members. Sec. 3 Duties of the various Committees shall be determined by the Executive Committee and they shall use the most current USGA Rules of Golf book as a guide. The following are to be considered Additional Committees: SHWI, OWGA and VLTP. The Chair of these committees will be appointed either by the President of the Shadow Hills Women’s Club or by the organization represented by the Committee. The Additional Committees shall attend the Shadow Hills Women’s Club Board of Directors meetings. Additional Standing Committees may be appointed by the President with the approval of the Board of Directors. Ad Hoc committee(s) may be appointed by the President with the approval of the Board of Directors which shall designate their duties. Definition: Ad Hoc Committee is created for a particular purpose or in response to a specific situation or problem, without considering wider or long-term issues of the Club. Nominating Committee: The President shall appoint one member of the Board of Directors, exclusive of the elected officers, who shall serve as Chair of the Nominating Committee. The Chair of the Nominating Committee will appoint members representing the communities and activities of the Club. The President-elect is also on this Committee. The President shall serve in an advisory capacity only. Sec. 1 Schedule for golf play by women will comply with the decisions of the Board of Directors of the Shadow Hills Country Club. Sec. 2 Only members of the Women’s Club, with established handicaps (as may apply to the various women’s golf groups/leagues), having paid the appropriate fee(s), are eligible to compete in any tournament and/or weekly 9-Hole or 18-Hole play. The member is to use an established handicap of 40 or under. If the handicap is over 40, she is still eligible to play, but must use 40. A temporary handicap established by the Pro Shop after five (5) games is accepted. There will be no reverting of scores until a true handicap, based on 20 games, has been established. 9-Hole and Twilight Leagues can/may determine their own handicap requirements. Those requirements shall be clearly posted on the appropriate league’s board in the Women’s Locker Room. Sec. 3 Standing Rules and Regulations, as determined by the Board of Directors, shall be communicated to the membership. Sec. 4 When competing for prizes, all players must play with a fellow competitor or competitors. Sec. 1 Amendments: The By-Laws may be amended by a majority vote of the dues paying Members of the Women’s Club present at any regular or special meeting; provided that the proposed amendment(s) has been communicated to the membership at least ten (10) days prior to the meeting. Sec. 2 Rules of Order: “Robert’s Rules of Order (Revised)” shall be the parliamentary authority for all matters of procedure not specifically covered by the By-Laws adopted by the Shadow Hills Women’s Club. Sec. 3 In the event a Chair cannot or will not be able to fulfill her duties, the co-Chair will move into the Chair position and continue in that position until the end of the calendar year. At the end of the calendar year, the co-Chair will assume the position of Chair for the following year. If a co-Chair is unable or unwilling to move into the position of Chair, as noted above, or if there is no co-Chair, the President shall choose a new Chair to assume the responsibilities relative to the position. Said new Chair will serve until the expiration of the original term of office. The co-Chair will continue as before the Chair position was vacated.